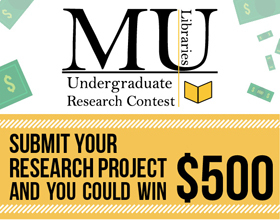 The University Libraries Undergraduate Research Contest recognizes and rewards outstanding research conducted by undergraduate students at the University of Missouri. Undergraduates in any discipline are invited to enter the contest, which will be judged by a cross-disciplinary panel of librarians. One $500 scholarship, and one $250 scholarship will be awarded to an individual or group project. The winners will have their projects archived in MOspace, MU’s digital repository. The research project can be a traditional research paper, a musical composition, a work of art, a video, a web page, or other creative work. It has to have been researched using the resources of the MU Libraries. The project will be judged primarily on sophistication of the research process and the materials used (as documented in the Research Process Statement). A parody of a famous piece of literature or any original piece of fiction for which the author did library research for their setting, criticisms, etc. The deadline for submission of all materials is January 31, 2019. Winners will be announced in February 2019.